It’s hard to believe that we had enough snow/icy conditions last Thursday to close down schools, businesses and events. It has been so mild since then, that it makes it easy to forget winter’s last gasp (being optimistic here). So, what’s been going on? Well, a lot of seed starting is underway. The last few weeks have been nothing but onions, leeks and a few herbs. We are now starting to turn our focus to the cool season crops – the brassicas (cabbages, broccoli, cauliflower – a first for us, kales, collards, etc.) and lettuces. With the growing area not complete, we’ve had to get a little creative. 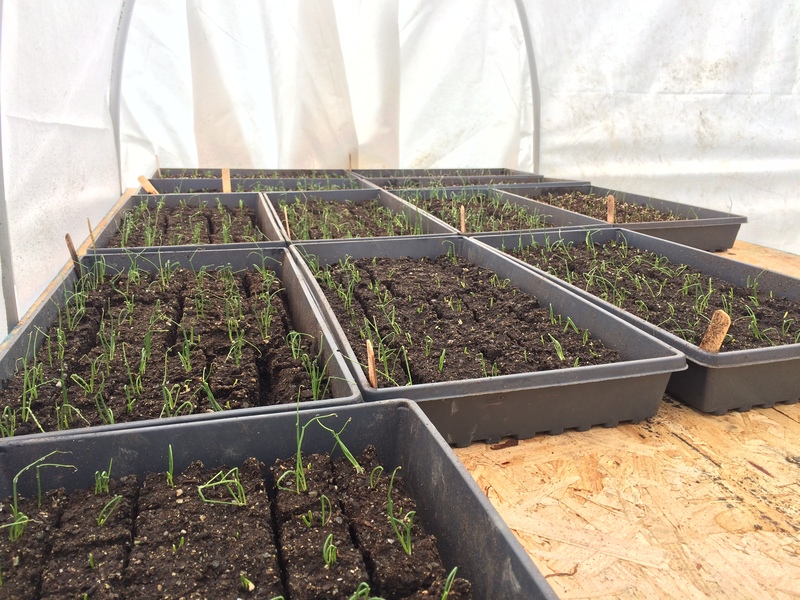 I think it has worked in our favor to once again start our seeds inside…the subzero temps would’ve been hard to beat if we were outside. To keep warm and pampered, seed flats are living in our kitchen. That is, until today. Some got moved. The biggest draw back to the indoor system is space. That means, if you have germinated, you go outside. 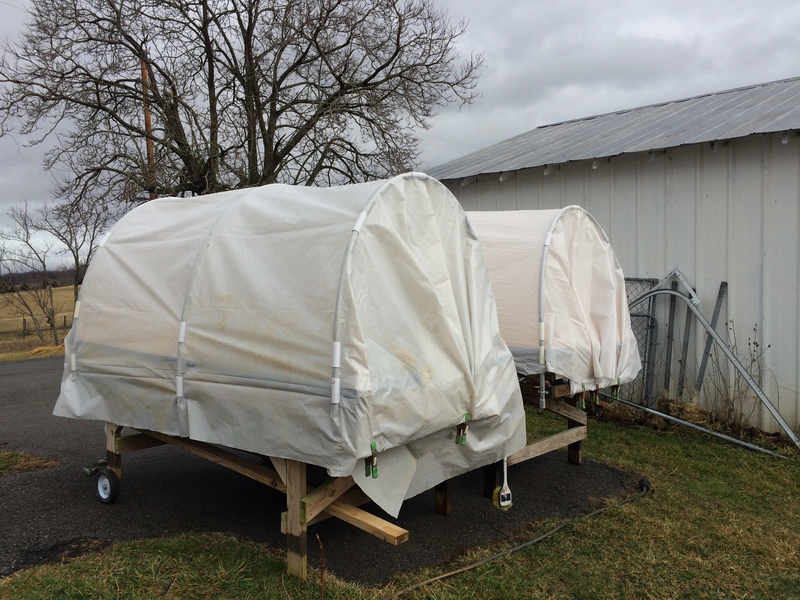 Here is where we had to improvise…covered wagons. The processing tables have become mini-greenhouses with recycled materials. Don’t they look like covered wagons? Some flats got moved out today. Hopefully, they will take the next step and get planted in the garden soon. First…some major drying out is needed! (Melted snow + bouts of rain = super saturated soil and standing water…ground is a soggy mess). For now, the covered wagons should work and buy us just a little more time to try and get the actual growing area finished. Now, off to go seed some cabbages! Looks great, Amy! We are chomping at the bit ready to get some things planted, hope it dries out soon!!!! Definitely a couple week off from where we were last year… but I guess everyone is in the same boat. Wish we had more tunnels!